LAST WEEK, Harcourt published Mohsin Hamid's second novel, "The Reluctant Fundamentalist," a brisk rewriting of Albert Camus' "The Fall" (1957) for modern times. This weekend it lands at #6 (!) onThe New York Times hardcover bestseller list. In Camus' story the participants of the story were a Frenchman and a passerby in an Amsterdam bar. 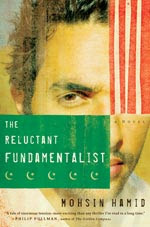 In "The Reluctant Fundamentalist," it's a Pakistani man named Changez and an unnamed, offstage American sitting at a cafe in Lahore, Pakistan. Over the course of a long afternoon, Changez unspools his life story to his silent listener in a tone that wavers between menace and curisoity -- it's not clear if he is an unreliable narrator, or one too reliable for our hopped up times. The story he tells is a deeply American one about falling in love with what the country promises, then becoming disllusioned by what it offers. I spoke to Hamid in February as he passed through town for the final deliberations for the B&N Discovery Prize (he was a judge). Here is what he had to say about Changez's voice, and how it came about. Q: Through most of the novel Changez is pretty happy in America, having been successful at Princeton and then at Underwood Samson, the financial firm. He really doesn’t have a realization that he might be betraying his culture (acting as a "janissary," as he describes it) until about page 140 -- and then he explodes in a critique of himself that sounds all the alarm bells of anti-globalization theorists. Did you purposefully inflate some of that rhetoric so it would ring these bells? A: I didn't inflate it, because what do you cling to? If you're a smart, well-educated person who has come into a sort of crisis about America. What do you do? What models and forms and structures can you reach out to, use to begin to express yourself? And the feelings that Changez feels are something to an extent that anyone who works in a tall building in New York feels. They won't articulate it as being janissary, because this is their culture. Everyone born outside New York, say, kind of feels like this is a foreign country: they kind of feel like it’s warped over there. They think, 'where I come from it's good old old fashioned values, but over there it’s warped!" Q: You worked at a consultancy firm in New York for a number of years. Did you have colleagues who felt this way? A: Almost all of my friends felt this way. I felt this way. A: Well, it's structural, it's largely structure. The American system is pay as you go, so when you finish graduate school, you have a lot of money to pay off -- but after college it's also structural. There isn't a structure in place to allow you to be a novelist if you're a Pakistani because you got to an H-1 visa to stick around, and they're going to pay a lot of money to pay the lawyers to get you the visa so you can stick around. So pretty much everybody winds up doing something corporate or sponsorable, so a lot of people who might do other things wind up doing this sort of stuff. And they have a crisis of conscience later. A lot of people don’t know what it is they're being asked to do until they do it. For me, I went to law school and all of my friends from law school ended up not being lawyers: part of that had to do with all of the people I liked wound up questioning what they were doing. A lot of them became consultants and investment banks. And those who did become lawyers had use identity crises. It's what happens when the smart sensitive person who is the product of and thrives in a liberal arts college where they're trained to think about the world in a holistic way, and about their emotional and political responsibilities and feelings, gets thrust into an environment where there is a lot of faith in research. And that grappling with the cultural background of liberal arts and the real world of being janissaries is I think extremely common. These extremes are not very fruitful. Whether it's the clash between free market and economics and redistrubitive philosophies, or whether it's between progressive secular atheism, and sort of religious values -- between Islam and the West – or between art and making a living, the extremes are quite dangerous, because they ignore the fact that life is quite complicated. And for me it boils down to: do I want to write full time? Which means I live in complete poverty. Or I write books quicker. But if I wrote books quicker they wouldn't be any good. This novel was complete crap really until the final draft, which is seven drafts and six years into the process. Q: Yet you read it and it feels so natural. A: Well, when I write drafts of my novels I tend not to look at previous drafts. Q: So you start all over again? A: I usually have them quite largely in memory. I have them around, but I start with a blank page, and I look at them, but I make certain choices that keep playing with the thing. In this case, it was using this particular voice and creating a narrative frame, which didn't exist until the final draft. And then I rewrote it with that frame and this voice -- and that unlocked it. It came out very fresh to me and very quickly – you know, in a year, end to end -- but I couldn't do that until I knew the story intimately, knew all the issues I had to deal with, knew all the characters I had to deal with, knew all the approaches I had tried before and failed at. And then finally I just came up with something that works. Q: This is a very old world voice, which I grew to like. He doesn’t use the typical Americanized voice. How did you come upon it? A: Interestingly, in Pakistan, people do talk like that, and they tend to be people who are incredibly anglicized. And are trying to communicate to you a certain sense of class largely because they have come upon economic hard times. So they wear the cravat, they play croquet, and they speak in this way even though they are basically broke. It's a voice that exists in the world. The nice thing as a writer is -- and this is a very American thing -- is so often a voice will give you a character. When you read Toni Morrison, Faulkner, Hemingway, their characters will say who they are by how they speak. This is an American thing. And if you can get a character from a voice, it means you can really strip a novel down to its bare bones. It's to say, we know who this guy is, because we know how he speaks. So let's just touch just those points we need to touch to create this story. A: Well it is longer; there are many ghosts in the novel in the sense that there's upwards of 1,000 pages of different manuscript lying around. There are things that Erica did and these characters did and stuff they have done and been which aren't in the book. But having written them once you can dispense with them, and then you can touch things which imply that they happened. It gives a book that iceberg quality. Q: The silences in novels are usually the most present, you're right. A: It's something which film does so much more than fiction. The reason is its stuck in a two hour frame. So what do you do with your two hours or 90 minutes? It's an enforcing device. You have to take a lot of stuff out. So for me, it was each chapter (in manuscript pages) had to be exactly 10 pages long. It had to end on the 10th page. Because I chose to do it that way, I had to make it fit. I knew I had 12 steps in the story – it was almost like a haiku at that point. You have to balance and puzzle with the thing until it works. I haven't been, as a writer, one who believed in plotting mathematically, but there is something about mathematics and nature: and if you create systems that have a certain degree of scale and just mathematical balance. There is something organic about that – it's like the Renaissance man in the circle. What are the basic numbers that rule who we are? It's easier for us to deal with things that are made in a way to our scale. In Pakistan that's a poetic choice. Because poetry is about structure, and structured poetry is pretty much rejected in America in the west now. But the nice thing about structure is it forces you to make choices. "Critical Outakes: Mohsin Hamid on Building a Voice" was posted April 14, 2007.